From simply an economic perspective approving the millage (property tax) that will fund the system is a no-brainer. Every study out there demonstrates that public transit can enhance the economic welfare of a community. But it's not just an economic argument that needs to be made. There's a moral one as well. Public transit makes it possible for young and old to get where they need to go. It allows the elderly to get to the doctor or the store when they can no longer drive. For those who cannot afford insurance on a car can get to their work. It helps equalize the community. 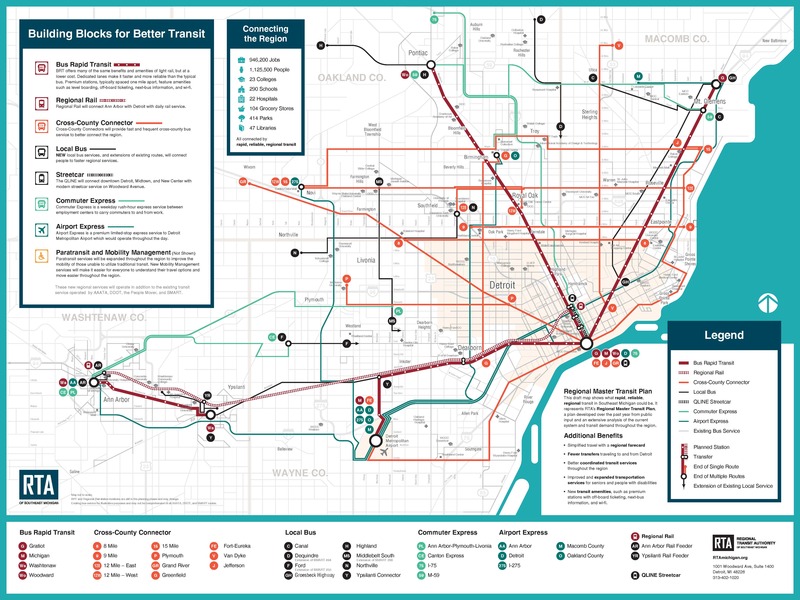 The map above visualizes the recently announced master plan for regional transit in Metro-Detroit. There are several components to the system that will appeal to different people. If one lives in the city but works in the suburbs, this system will make the travel more efficient. The same is true for those who live in the suburbs but work in the city. Today there are three different transit systems (counting Anne Arbor), which to this point limit one's ability to move from one system to the next. There are issues to be resolved between the existing system, but I'm hopeful for the future. When we vote to support a system like this there needs to be a degree of altruism involved. Whether or not I use the system, a vote for the system allows one to stand with others who need the system to survive. At the same time, I need to have some sense that I could if I desire access the system. There are in this plan enticements. For one thing, I'm attracted by the creation of an express bus line that would go from the Troy Transit Center to the Detroit airport. Besides that, if the proposed Bus Rapid Transit (BRT) system works well might make getting to a Tigers game or some other event downtown more accessible. If you're reading this and you live in Southeast Michigan/Metro-Detroit I would urge you to examine closely information on the system, and consider voting for the millage that will support the ongoing existence of the Regional Transit Authority. Do it for yourself and do it for your neighbor.